PRODUCT DESCRIPTION (3.3/5) The LitterMaid LM580 Classic Series Litter Box helps you to maintain the cat litter box by scooping the waste 10 minutes after your pet has used the box. After your cat has done its business, special sensors activate to clean the waste and also it can be activated manually for extra scooping. 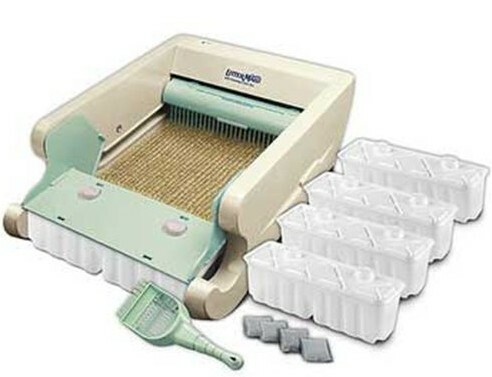 The Littermaid Classic LM580 features a detachable rake mechanism for easy cleaning, removable litter tray, high side-walls to avoid litter dispersion and a safety bar that stops and reverses the rake in case of blockage, for example, if the cat jumps in the box during the cleaning cycle. 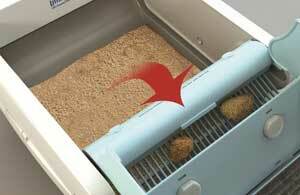 This automatic litter box allows cat owners to work until late or when going out for a couple of days. The Littermaid LM580 with 14” x 14” pan size, is suitable for single-cat households. The unit works with AC adapter and uses 8 AA batteries as backup in case of power outage. Dual motion sensors that activate cleaning cycle 10 minutes after the pet uses the box. Ten minutes after the cat has used the Littermaid Classic special dual-motion and timed sensors activate and a rake starts sweeping the waste into a replaceable plastic compartment which has a carbon filter attached to neutralize odors. If the cat re-enters the litter box during the 10 minutes countdown, the timer will reset and it will start a new countdown for another 10 minutes. 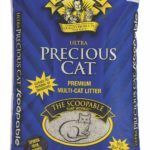 Manufacturer recommends to use LitterMaid with Premium Clumping Cat Litter. See a video how the Littermaid works here. If you want more waste receptacles and carbon filters, the Littermaid LM680C it is basically the same version but includes 8 waste containers and 8 carbon filters, plus the ramp. What are the Pros and Cons of the Littermaid LM580 Classic Series? It reduces the frequency and time of scooping. Plastic rake adheres less to waste than metal rake. 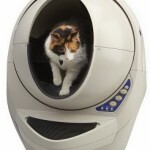 It uses less litter than a regular litter box. Easy disposal of the tray. It includes scooper for removing waste not caught by the rake. It runs in AC adapter mode and 8 AA batteries as backup. Noise level is OK when it cleans, it is not silent, but it is not too loud either. The rake sometimes only drags the waste getting stuck on the rake, so it does not fall into the compartment (with a good premium clumping litter you can avoid this). The waste receptacle lid doesn’t attach strongly to the plastic lid so if not placed carefully it could fall off and cat feces end up on top of the lid. On occasions the waste sticks on the bottom of the unit, not getting pushed by the rake. This has to be cleaned manually. The full line for litter is too shallow, not good for diggers. Sensors don’t work when dusty. If too much litter gets on the edge the machine or with big clumps, it will get blocked and stop. The ramp has to be ordered separately. To save money on waste trays you can place a plastic bag instead of buying replacement or you can get the Litter Works which allows you to be almost a week without emptying the litter box and it’s simple to dispose the collected waste. Check a full review here. If you overfill the box it will be harder for the motor to make the rake push the waste so make sure to pour litter under the fill line. Make sure you don’t put it too close to the wall or the cat will defecate or urinate on only one side, spilling out litter from the receptacle. 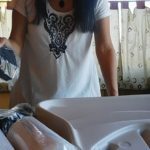 Customers recommend to buy the “Permanent Lid” attachment for the Littermaid, or the “Perma-lid Guard Combo” to stop the problem of the receptacle falling off the litter box cover. Buy rechargeable batteries to backup the system. Spray the rake and the bottom with silicone to keep clumps from sticking. The unit uses 8 AA batteries and not 8 D batteries as stated on the description. These 8 AA batteries are consumed fast and are only for backup in case of power outage and are not meant to be used as main power source. This means the Littermaid has to be plugged in. A great advantage of the Classic version over the more recent Littermaid versions is the rake made from heavy molded plastic and not metal. This creates much less adherence of the waste on the rake. The unit has two reset buttons, one on each end of the right sided track when facing it from the waste receptacle side. Push them to reset the machine. Don’t overfill the litter pan. If you put more litter than indicated the unit will malfunction and also will damage the motor. Also too much litter will make the unit to spill litter when cleaning. Spray silicone on the rake. This will help to reduce waste from getting stuck on the rake. Buy the “Permanent Lid” or tape the receptacle to the lid of the box. 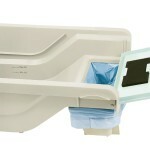 This will prevent the receptacle from falling onto the floor with waste. Manual scooping. Sometimes you may have to scoop if the rake does not get all the clumps into the waste compartment. Doing these adjustments, the Littermaid LM580 will work good for you and your cat. One thing to mention is that some customers state that though this unit works well, it does not have the same quality of materials than the very first Classic version of the Littermaid but it’s still a better unit than the more modern Littermaid versions. For cat owners willing to buy good quality clumping litter. If you want help in scooping and not a maintenance-free unit. if you are working and your cat is home alone for some hours and he loves its litter box to be clean. For diggers that pile too much litter over their feces or urine. If you don’t want to spend money in good quality clumping cat litter.